Holland conjures up lots of iconic images in my mind, like windmills, dykes, tulips, coffee houses, brothels and people with a fascination for the colour orange, as well as, and much more importantly, bicycles. So after much virtual ‘recccying and googlage’, I put together a cycling tour around the central area of Holland, starting from the Hoek of Holland, going north along the sand dunes, lunch in Leiden, afternoon through the bulb fields and along the Westeinderplassen (yes, really) to Amsterdam, where I stayed with friends for 2 days. 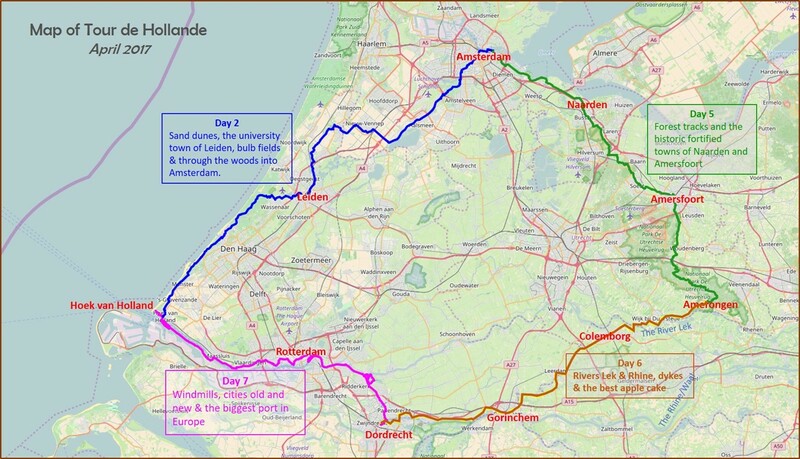 I followed this with 3 days of riding back to the Hoek via Naarden, Amersfoot, Amerongen, Dordrecht and Rotterdam. My expectations were largely based on googles street-view which I used to check the scenery along the routes I was creating, and I have to admit that it worried me (picture left)! It wasn’t so much that it looked flat and uninspiring, more that every street-view shot looked almost identical, but as it often turns out, my dampened expectations were totally blown out of the water! I designed the route to go through as many interesting towns as possible, on small country roads which didn’t have cycle lanes, or on cycle tracks that were exclusively for bikes and not near a road. My trip began and ended with an overnight ferry from Harwich to Hoek and back, which somehow added to my excitement. Maybe just the adventure of going to sleep in one country and waking up in another. It also had the advantage of not having to pack my bike into a bag, so setting off from home with my ‘wee stead’ loaded up added to the fun, and reminded me of my old cycle touring days. I took the train from Liverpool Street to Chelmsford, as finding an enjoyable route from home to Harwich would have been a 100+ miler, and I’m more into enjoying the ride than clocking the miles. Felixstowe from the sea-front of Harwich town. The weather forecast was appalling; cold with scattered blustery showers and the risk of thunder and hail. I nearly wimped out and stayed on the train at Chelmsford but knew that I would regret it. At this point I was feeling a little nervous about the whole trip, possibly because it had been a while since I had done any solo touring. As it happened the weather turned out to be on my side and the Sustrans route 1 was well-marked, quiet, picturesque and a balm to my nerves! At Colchester I picked up Route 51 (named the North Sea Trail) and found that it was equally pleasant, apart from half an hour of main road just after Wivenhoe. I arrived at the International port too early and decided to continue on to the Historic town of Harwich, which was only an additional 3 miles. As I looked down the old High Street I couldn’t help thinking there was something very British about it, and then my eyes alighted on the UKIP headquarters. I had an uncomfortable few moments pondering my sequence of thoughts!! I wandered around the town looking for a place to eat, but like a lot of declining seaside resorts, most of the pubs had an edge to them that was a tad off-putting to a stranger ….and a female one at that. I eventually found a real gem of a place, not cheap but it sold fresh Cromer crab and a pint of delicious hoppy ale. I couldn’t think of a better way to start the trip and I hurtled back to the Port in a post-alcohol haze of contentment. I got to my windowless cabin at around 9.30 pm, watched some telly, went to sleep and awoke at 6.30 am on the other side of the North Sea. Simples! As I set off from the port I quickly realised that riding in a country where bike lanes are an inherent part of the road design, meant that I had to understand a whole new set of rules. As I approached the first junction I had no idea who had the right of way, and this was complicated by the change from driving on the left to the right. I felt like I needed an L plate or a English flag on a number of occasions, even though it did feel luxurious having the super smooth bike lanes to myself. I was very soon out of Hoek and along the dunes of the coastal path, with abundant wildlife twittering, hopping and floating about me. The Coots and the Rabbits seemed very tame, maybe it was just feeding time. I have to mention at this point that the first of my expectations was challenged. Holland isn’t as flat as a pancake ……..not that I’m saying it’s hilly, but there were distinct undulations. I was, after all, cycling over beautifully paved sand dunes, and when has a sand dune ever been flat? There was also a stiff north easterly wind, and a couple of panniers adding to my rolling resistance. I was happy but slow! At The Hague I was forced inland in order to cross the Verversingskanal, and for some inexplicable reason my GPS took me a very strange route through the suburbs. As I was nearing the edge of town a massive black cloud dominated the horizon and was directly in my path. I stopped to put on every piece of water-proof clothing that I had brought with me and set off feeling more like a motor-cyclist. As I continued along the sand dunes, the cloud that was in front of me moved inland without a single drop hitting my black amphibious outer-shell. It seemed like a miracle and I managed to snap the moment with my camera phone (feature photo above). I continued on through the sand-dune nature reserve on a smooth winding track, past spring-green woods bursting with life, and my assumption that sand dunes would be boring was just plain wrong. Eventually heading inland towards Leiden, the going became truly flat and I found myself cycling through a landscape that had just been doused with heavy rain, making everything thing sharp shiny and new, just for me!! Leiden was a good-looking university town with plenty to satiate my appetite for Dutch icons, including a great windmill, plenty of canals with draw-bridges, old barges, gabled houses and tulips. Onward to the town of Keukenhof and the capital of the areas bulb growing industry. The tourism was on a fairly industrial scale as well. My phone battery died on me mid bulb-experience, but here is proof of my presence! I think I preferred the wild ones on the side of the dyke. With tiring legs, I stopped for a late lunch in Keukenhof and then set out for the final push to Amsterdam, along the vast inland lake of Westeinderplassen, with it’s hosts of boat-houses. The weather started closing in as I passed through a wood on the outskirts of Amsterdam (called the Amsterdam wood! ), and as I entered the city the heavens opened. My GPS battery was dangerously low and I was on a mission to get to Java Island, to the north of the city. My route took me through the Rijksmuseum building which was spectacular; only in Holland would a two lane cycle highway go through one of the capitals major cultural buildings. With no time to stop I pushed on over all the semi-circular canals. The bike traffic at rush hour was verging on terrifying, so I didn’t stop to think about it. Arriving a little earlier than arranged, but at least in one piece and with the last 5% of my GPS battery, I found a bar and calmed my nerves with a steadying wies beir. Nothing if not predictable! I set off from Amsterdam with a mixture of emotions; not wanting to leave the security of my friends, but also being lured by the open road and wanting to continue my journey. My stay in Amsterdam had coincided with Kings day, when everybody celebrates the King’s birthday (the first King of Holland, William of Orange, hence the love of that particular colour). My host generously provided a suitably embarrassing orange tank-top to wear, but it ended up being hidden beneath layers of clothes trying to keep the biting north-sea breeze at bay. Shame! I also experienced riding a proper dutch bicycle and was invited onto a house boat, so it was a fully immersive experience. Thanks Girls! My route out of Amsterdam took me next to the Amsterdam Rijnkanal, which is the worlds busiest canal, skirting the edge of the massive Ijmeer lake that used to be a sea inlet, and passing through the fortified towns of Muiden and Naarden. Beyond Naarden, the landscape changed, no more canals it was all woods from now on. Initially the paths were as flat and beautifully maintained as the previous ride, but as the morning progressed, I found myself on smaller and less well-marked trails, and yes, it was distinctly undulatory. Although I do have a penchant for off-road and gravel sections, it is a bit different with a couple of loaded panniers on board. It was when I found myself on a section of singletrack complete with roots, drops and well maintained burms, with a full suspension mountain bike coming towards me at speed, that I realised my mistake. I had somehow found my way into a mountain bike park. The surprised look on the mountain bikers face as I tried to dismount and drag my fully laden road bike into the undergrowth to let him pass, said it all. I think the word ‘dumb’ springs to mind, but hey I wasn’t likely to see him again. I managed to re-navigate this section of the route to a more sensible option and decorum was restored! I arrived at Amersfoot in time for lunch and found a market day in full swing, with a lot of stalls selling fried fish. It smelt good but as I pushed my bike passed the multitude of eating options I was somewhat overwhelmed by it all. I just wanted one cafe. Perhaps I was tired or concerned about getting to Amerongan before the shops shut, but whatever the reason I decided to push on. I was quickly out of town and back out on quiet forest paths and eventually in one of the oldest woodlands in Holland called Nationaal Park de Utrechtse Heuvelrug, with beautiful smooth trails wherever I looked, the riding was sweet. As I neared my final destination I had planned to climb the highest hill in the district, standing at a whopping 69.2 metres, but alas, it wasn’t to be. It soon became clear that the bike path to the top was for mountain bikes, and I really didn’t want to repeat my earlier experience. With 80 km out of my legs, I was happy enough to push-on to my Airbnb in Amerongan and suss-out the eating options for the evening. My bolt-hole for the night was a very attractively converted garage at the bottom of someones garden. It was huge and as I entered the building I realized to my dismay that the temperature was the same inside as out ……..cold. I searched high and low for a thermostat or boiler but to no avail. Being a tad tired at this point, I sat on the commodious settee in my jacket and gloves feeling tired and glum and contemplating a whole evening of ……cold. I eventually managed to get hold of the land-lady, who told me the thermostat was next to the toilet, and well, it was! I had no faith that it was possible to heat such a building this side of Christmas, but luckily I was wrong. Things were looking up. I decided to eat-in rather than look for a restaurant, and having spotted a supermarket on my way, I returned with an empty pannier and browsed the myriad of Dutch ready meals. I was trying to choose between Stroompenbollens and haagenbratjesbrood, when I realised that I hadn’t checked if the B&B had a microwave, so I reluctantly chose tortellini with a mushroom sauce! When I returned, my five-star garage was quite warm and I actually dared to take off my jacket. By 8 pm I was warm and fed, the sky turned blue and the light outside took on a magical glow. I grabbed my phone, jumped on my bike and explored Amerongan’s finest sites, bathed in a light that was even too much for my camera phone. It had been a day of metaphorical and real undulations but definitely ended on an up. Apple cake to die for! The previous evenings promise of good weather held good, and the sun rose into a clear blue sky. The wind was brisk but to my joy, was at my back. I whistled along the tops of dykes on near empty roads, past cow-grazed polders and through small picturesque villages, at one point using a river ferry to cross the River Lek. By morning coffee time I was in the small town of Culemborg, sitting in a town square full of historic buildings, with numerous cyclists of all ages, everyone enjoying the sunshine and the local apple-cake, which is definitely in my top ten. Looking around me, I couldn’t help thinking the Dutch had got a lot of things right, including a very healthy attitude to exercise and old age! Although there were a fair few lycra-clad Mamils and Mawils whizzing about, there were also lots of people on ordinary bikes just enjoying a day out. Maybe I should start looking into retirement homes! My route took me from the River Lek to the River Waal (which turns into the Rhine), and to a town called Gorinchem for lunch. It was larger than Columborg but still had a restaurant dominated historic square. On account of the breeze, it was a bit of an effort keeping everything grounded, but great fun watching the waiters trying to keep everything under control (my beer mat ended up in the salad of the lady sitting next to me). Onwards on what felt like my e-bike, and as I neared Dordrecht the scenery started to become more industrial. As I crossed a massive bridge across the Waal, and inspite of the wind being behind me, I felt in need of a little shelter and was relieved to arrive at my next port-of-call. Dordrecht is a, you guessed it, picturesque city on the river Waal and my Bed for the night was in a tiny house which overlooked a canal, just behind the main street. My hosts where there to greet me and invited me to join them for dinner at an ‘eat-in’ in a Lutheran church hall (which I accepted), but first I sunk into the comfortable settee for a brief rest, with my cheeks burning and my hair like a burst mattress I was out like a light for about 30 minutes. The food was delicious and I found it difficult not to appear greedy and when I returned to my lodgings, in spite of my 30 minute power nap, I slept soundly. One of the many ‘moving roads’! I awoke to leaden grey skies, packed my bike and set off to find coffee and a bun. Monday in Holland seems to be more like a Sunday in the UK, with most shops and cafes closed. I trundled along the cobbled streets until I found myself at the river ferry terminal. I had planned to get the ferry to Kinderdijk, which has a collection of 19 windmills built in the 1700’s, and then onto Rotterdam. The boat trip involved changing boats at Ridderkerk and boarding a little ‘shunter’ which took me across the Waal to Kinderdijk. I had the boat to myself, but as it pulled in to the jetty, I was faced with a barrage of tourists hovering around a gift shop and cafe, and my heart sank! Although I was starting to get hungry, I found the idea of battling through the crowds to find somewhere to lock my bike, followed by competing for a table at an overpriced mediocre cafe, unpleasant, to put it politely. I ‘mooched’ along the dykes jostling for space and practicing my slow riding bike control skills, past numerous mills, some of them abandoned and some still occupied, made a loop through the village of Alblasserdam and back on the boat to Rotterdam, with an ever widening hole in my stomach. Kinderdijk on a grey day! With the previous day being wall to wall sunshine, I was finding it difficult to fully engage with the day, and I was also slightly distracted by the fact that I had to get to Hoek before the Stenaline office closed, to sort out a problem with my booking. The scenery from Kinderdijk to the centre of Rotterdam was unremarkable, and would have benefited by a blue sky backdrop, but that’s just over-expectation on my part. My journey by boat ended at the Erasmus bridge which dominates the river and city skyline and links the north of the city to the south. I had planned a cycle tour of the centre of Rotterdam which turned out to be on a much smaller scale than I had imagined, but interesting none the less, and at last I found somewhere to buy coffee and a bun! I cycled back along the river, past the famous Cubic Houses, which where situated on top of a major road junction, and on past the Central Market (Markthal) and the World Trade Centre, down a long tram-filled road called Nieuwe Binnenweg to Delfshaven. This is one of the few areas of the city that survived the extensive bombing of WW2 and has the additional attraction of a brewery with a cafe attached, which I was looking forward to visiting. My Monday morning feeling prevailed as I realised that it was shut on a Monday, and I was left yet again looking for an interesting place to eat. I found a little restaurant on the quayside and was happy to have a leisurely late lunchy breakfast. My last challenge of the day was to ride to Hoek in time to check my bike ferry booking at the Stenaline office, and after a fair few kilometers of city sprawl, I found my self hurtling along the riverside path, and with parks whizzing by on my right and massive tankers on my left, my mojo returned. I found the ferry office with little difficulty and sorted the ticket for my return, which left me with a few hours to explore. Hoek wasn’t unpleasant, but I suppose that isn’t much of a recommendation! I was surprised to find a wild wooded area to the north of the town, which filled half an hour, if you went around it twice! Eventually I decided to try out another restaurant and have another long leisurely meal, as the ferry check-in didn’t start until 8.30 pm. I found one with a great view of the river, and although it was the most expensive of the trip I was in the mood to treat myself. I read my book, watched the boats, drank my way though a couple of strange beers and watched the light start to fade over the largest container port in Europe. Goodbye Holland, I’ll be back! Just to add a little spice to my final minutes on Dutch soil, I turned right instead of left out of the restaurant and found myself back in the sand dunes wondering were on earth the ferry terminal had disappeared to. Surely the beer wasn’t that strong? When I realised my mistake, and in a panic not to miss the boat, I unknowingly hurtled past the check-in booth and only stopped after I heard a furor behind me. It turned out to be the lady in the booth running down the car lane trying to alert me to her existence. The porthole in my cabin, which was single occupancy, was massive and looked out over the front of the ship. I had a double bed, with another bunk bed, a telly and a large ensuite, all the £35. I watched the last of Holland slip away from the comfort of my bed before giving in to my heavy eye-lids. I had planned to take the train directly from Harwich, but as I rolled off the boat, fully kitted up with breakfast inside me, it seemed daft getting onto the train, so I re-traced my earlier route along Sustrans 51. Harwich was waking up to to a sunny spring morning and I happily pootled along to Colchester, via Wivenhoe and a lovely section of trail along the River Colne. Okay, it wasn’t super smooth two-lane cycle paths, but it was pretty dam good! I couldn’t help indulge in a large bacon buttie on Colchester station, just to affirm that I was well and truly back home. As the train chugged through the London suburbs, I looked back on the week and knew that there were more adventures to be had across the North Sea. Another dose of Dutch is definitely on the cards. Home soil, and a trip along the Colne at Wivenhoe.